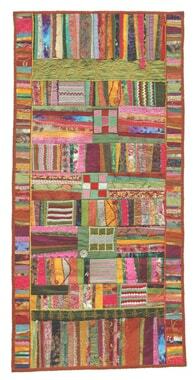 Then the women remembered that they also used another embroidering technique, klosterstich, called pokhtadusi in Afghanistan As this can be done much faster than kandaharidusi, it was soon generally used. Two pieces by Marzia: The small one is from 2005, the other two years later – what a development! This very small cloth is a touching testimony from the beginnings of the project: The women are looking for ways of expression by means of the needle, ways that have been lost as they stopped embroidering, but also because, as farmers, they spend much time working in their vegetable gardens and harvesting; activities that are very difficult to reconcile with the easy flexibility required for embroidering. In the meantime, Marzia has perfected her abilities extremely well. She has developed an inimitable, severe graphic style. Marzia’s relatively new embroideries show this development very clearly concerning the patterns as well as their execution. 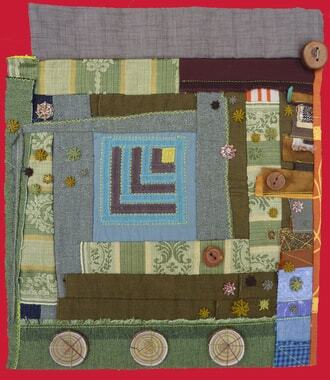 The geometrical embroidery, like a window frame, provides the inspiration for these three small pieces by Pascale Goldenberg, “Log Cabins”, irregularly arranged, using leftover fabrics from the seamstress. 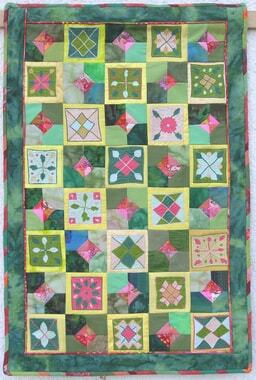 Quilt from Gerlinde Buddensiek with ten squares from Latifa. 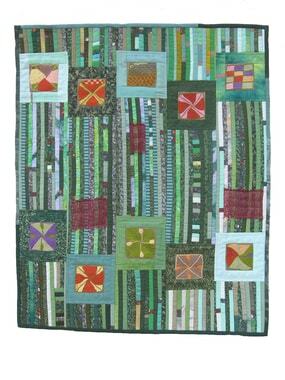 “Stone wall” – embroidered quilt from Renate Hollstein with twelve sqares from Nooriagul, using Afghan threads of poor quality. 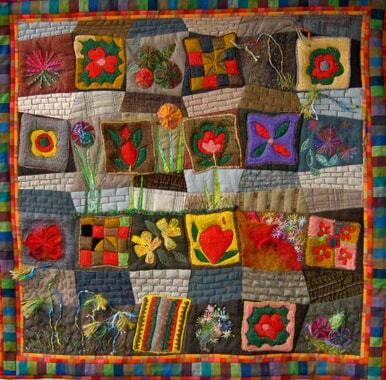 Quilt “Afghan Garden” from Pascale Goldenberg and Elsbeth Lampe with eight squares from Simingul done in bead yarn. 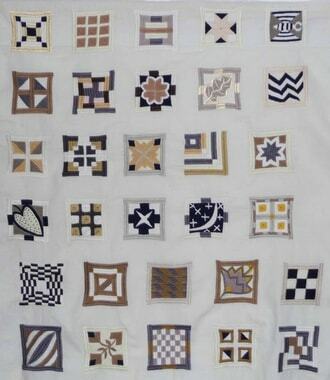 In spite of the rather poor quality, the first squares could be sold, and I would like to thank all those who, through their magnanimity, have contributed to giving the project a chance. Mahjan’s Garden was created by nine women from Freiburg in the course of an open day. 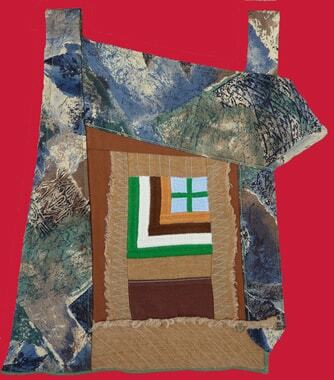 Whoever could afford a few hours, half a day or even a whole day, arrived at House Goldenberg with a sewing machine. Initially, there was just an idea to improvise on. 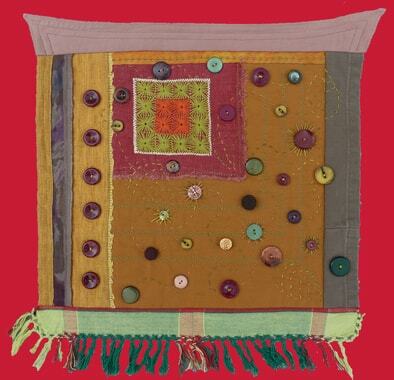 Materials, fabrics, threads, fillings and buttons were all supplied. 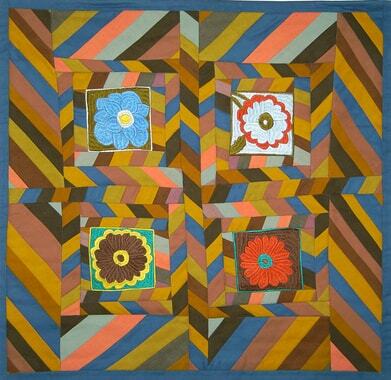 The small quilt was finished in the evening. It will not be sold; it is used to promote the project. P.G. looks after the project like an orchestra conductor; a large group of friends makes it possible for the project to continue. Many talents and abilities are required. There is a lot to do, the activities are varied, and some of them are not very enjoyable or rewarding, such as ironing some 250 embroidered cloths (some 30 kg) or the sorting and arranging of the threads for the embroiderers. Mahjan’s Garden is a symbol of a faithful team that has been working so very efficiently over the years. THANK YOU to all of you that I can count on, in Freiburg and all over Europe!